In December 2016 the Home Temple project commenced with a ground breaking ceremony. In May 2018, three Sotoshu officials travelled from Japan to present Ekai Korematsu Osho with a certificate and plaque. Tokozan Jikishoan is officially now a Soto Zen temple. The seventeen months in between were a period of great affirmation and support from the Jikishoan community, and endless work on the part of Ekai Osho and many volunteers. Literally endless, as work continues in and around the new temple. This project was funded through donations to the Abbot’s Support Fund. Donations to the Jikishoan Building Fund have not been used for this project. The goal of Jikishoan purchasing its own property is temporarily on ‘hold,’ while activities at Tokozan Jikishoan become integrated into the annual calendar of events. The next special event is Jikishoan’s 20th Anniversary in May 2019. Preparations are already underway. The most recent Update can be viewed by clicking here. Donations toward the ongoing work at Tokozan Jikishoan and towards the 20th Anniversary celebrations can be made to the Special Projects and Training Account. For more information and EFT details please contact the Building Sub-Committee via contact@jikishoan.org.au. 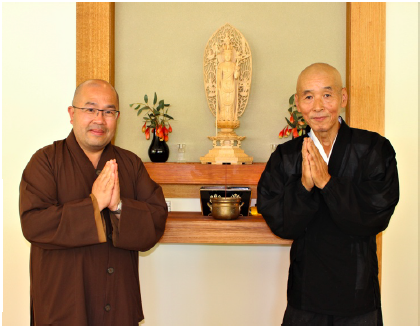 With deep gratitude from the Jikishoan Zen Buddhist Community for your interest and contributions, as we continue to work toward actualizing Jikishoan’s vision: to offer transformative Buddhist learning, experience and cultivation for everyone. Jikishoan is a not-for-profit organisation.